Sometimes it seems pointless to even try keeping up with the scads of new flavors that Doritos rolls out on a seemingly continuous basis. Especially since most of those flavors seem to disappear from most shelves a few months later. (Whither goest, Doritos Quest?) Besides, the vast majority of Doritos flavors fall along the “cheese + spice” axes, so if you’re jonesing for that long-gone Doritos Extreme Kickin’ Chili flavor, just wait a few months for Doritos Chili Heatwave to grace your convenience store’s shelves. And yet we can’t resist the siren call of new Doritos flavors, especially when they’re marketed in a head-scratching (but frankly brilliant) way. 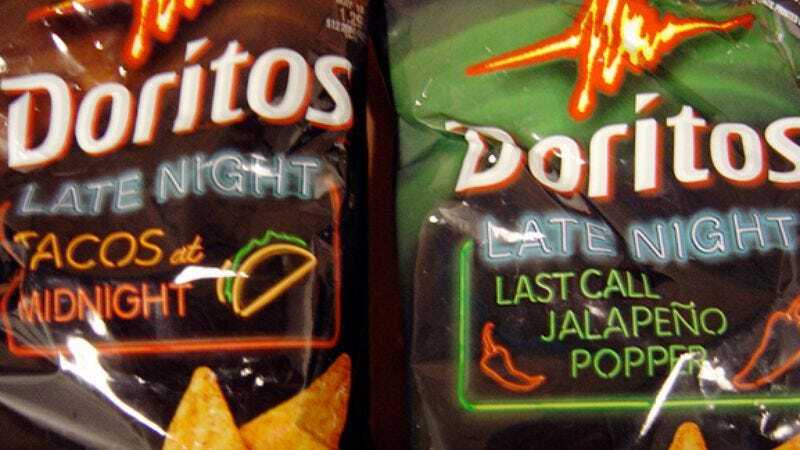 So when our web guru Jesse tipped us off to a couple of “Late Night” Doritos variants he’d spotted, we had to investigate. What constitutes a “Late Night” Dorito? Apparently neon-and-black packaging and the sort of flavors that taste best when you’re falling-down drunk: Last Call Jalapeño Popper and Tacos At Midnight. (Hey, we don’t name them, we just eat them.) Sober folk might chuckle at the blatant pandering to drunks and stoners, but anyone who’s ever stumbled into a 7-Eleven at 3 a.m. looking for something to stop the spins will surely recognize that those crinkly little bags of flavor-dusted sodium pellets would sound like omigod-the-best-thing-ever in that situation. When we picked up the Late Night Doritos at our local 7-Eleven, we noticed a couple of Anytime Doritos labeled Toro and Diablo with badass bull and demon graphics on them, respectively, so obviously we had to throw them on the pile. Turns out these flavors are actually distributed by Sabritas and only available in Mexico, which obviously means that our neighborhood 7-Eleven is actually some sort of unexplained time-space portal into Mexico. Mmm, mysterious snack foods. A dedicated taste tester knows the right frame of reference is critical. Perhaps a fluorescent-lit office building at 4 in the afternoon isn’t the ideal situation to consume Late Night Doritos, so we offset the incongruous setting by tapping into the snacks’ subconscious message—“eat these when you’re drunk”—and paired them with a couple of strange-ish beers that have been sitting on Josh’s desk for months: Kelpie Seaweed Ale and Fraoch Heather Ale. Then, just because we were sick of looking at them, we threw in the Burger King Flame Broiled Potato Snacks that have been languishing in the taste test to-do pile forever. This turned out to be a very bad decision indeed. Somewhat surprisingly, the Doritos were a hit all around. In spite of some post-tasting remorse as we stared at our yellowed fingers and burped up spicy-cheesy bubbles of despair, everyone seemed perfectly happy to shovel these down. Each flavor was declared someone’s favorite, but there was no clear winner or loser. The Diablo chips were notable for their bright red powder coating, but the flavor was pretty mild, just basic chili with a slightly citrusy undertone. The Toro chips were habanero-flavored, so they definitely had more of a kick, and the habanero flavor was spot-on. While even the most spice-averse (i.e. me) could get them down without much problem, they do have a sneaky sort of heat that builds as you eat more of them. The Late Night flavors were a little more unusual, though both tasty in their own way. Tacos At Midnight indeed taste like tacos at midnight, meaning tacos as interpreted by taste buds that have been blunted by booze and smoke. It’s basically a corn chip dusted with the taco seasoning that comes in those all-in-one taco kits—it pretty much tastes like how a Taco Bell smells. Last Call Jalapeno Popper has an almost creamy texture that complements its flavor profile, which recreates the gooey, scalding-hot deliciousness that oozes out of the ubiquitous bar food. There’s almost no spice to speak of, but the separate components—jalapeno, cheddar, and cream cheese—are distinct and delicious. The beers were perhaps not the best accompaniments to such lowbrow fare, as both have flavors that were a bit too complicated to register on our Dorito-dusted tongues. Compared to the blast of cheese and spices that preceded it, the Fraoch Heather Ale tasted like watery nothingness. But a few more sips reveal a pleasant bouquet of flowers and honey, and it’s exceedingly smooth going down. It definitely won’t put hair on your chest, and is probably not the best complement to a Late Night Doritos-fueled Halo bender, but it would be nice to sip on a patio in the summer, or perhaps while frolicking in a field of honeysuckle and butterflies. The Kelpie Seaweed Ale was the polar opposite, a dark, malty brew that’s slightly sweet, but in a more earthy, rugged sort of way. There is actually seaweed included in the mash during brewing, so there is a sort of oceany character to the beer if you’re looking for it, but deeper flavors like chocolate and coffee are more dominant. All in all, it had been a pretty successful taste test; then we decided to throw in the Burger King Flame Boiled Potato Snacks. Sweet baby Jesus, was that a bad idea. Now our fond memories of Doritos and beer will be forever tainted by these cruddy little wafers of horrible. First of all, they’re potato “snacks,” not chips, and are uniform in size and shape, which screams “reconstituted potato paste.” There’s really nothing remotely potato-like about them. Second, the flame-broiling process apparently amounted to someone rubbing his feet all over the chips, then and masking it with Liquid Smoke. More than one person likened them to dog treats. Strangely, even though not one person seemed to go back for a second chip, the chips disappeared from the kitchen shortly after the taste test was over, presumably sent back to the cruel fires of Hades that birthed them—or better yet, the trash. Where to get them: For the Doritos, try your local convenience store, in case it also has a portal to Mexico. We got the beer in the imported ale section of a local liquor store. The Burger King potato snacks came straight from hell.